Lemon and pepper is a classic flavour combination that works well as a seasoning on both chicken and fish. This version if further taken up a notch with an array of herbs and spices, making for one seriously delicious mouthful. With the inclusion of cauliflower rice, enjoy this dish as a lower-carb dinner option. A big thank you to talented Aussie-based food stylist and photographer Sally O’Neil for sharing this scrummy recipe with us. Sally runs the popular health and wellness platform, The Fit Foodie, and created Fit Mixes, who sell a DIY all-natural protein ball mix. She is the author of Love Move Eat (Bauer Media, 2017), a guide to living your best life, and is currently a nutrition undergraduate. For more on Sally, head to her Instagram here. Add olive oil to a frying pan and preheat to a medium. Roll chicken breast in the herbs and spices mix. Squeeze over half the lemon juice. Cook the breast for ten minutes. Flip and cook for an additional five, until cooked through. Place the other half of the lemon to the pan, with the cut side down. Meanwhile, prep the rice by finely blending the cauliflower to a rice-like texture. Mix the spinach through. Dress with additional lemon juice and a splash of olive oil. Season with salt and pepper. Remove the lemon and the chicken from the pan, and then slice the breast on an angle. To serve: place the rice mix in a bowl and top with the chicken and charred lemon. 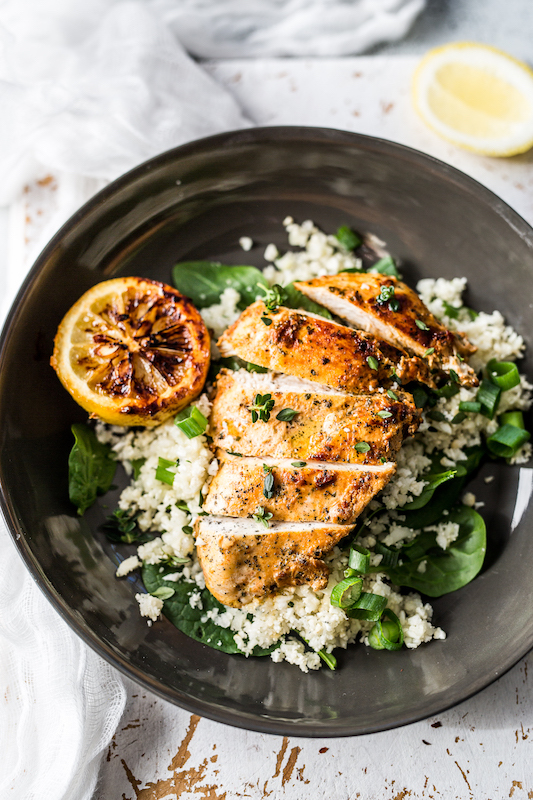 While lemons contain some iron, adding a squeeze of lemon juice to a meal can help aid the iron absorption of other plant foods that are a richer source (known as non-heme iron), for example spinach (1).